Dubai (UAE): Getaneh Molla of Ethiopia and Kenya’s Ruth Chepngetich won the 20th edition of the Standard Chartered Dubai Marathon today (Jan 25) with both athletes producing spectacular course records that rank among the fastest times in the history of marathon running. In excellent weather conditions, Ethiopian Molla clocked 2:03:34, achieving the first sub-2:04 time in Dubai. He improved the former course record – set in 2018 - by 26 seconds and became the sixth fastest marathon runner ever. It is also an unofficial world debut record by the 25-year-old. Second-placed Herpassa Negasa also ran sub-2:04 with 2:03:40, making him the eighth fastest of all time, while Asefa Mengstu completed an all-Ethiopian podium with 2:04:24 for third place. In a stunning women’s race, Kenya’s Chepngetich achieved the third fastest time in history with 2:17:08. Only Britain’s world record holder Paula Radcliffe and Kenya’s Mary Keitany have ever run faster as the 24-year-old smashed the course record by more than two minutes. Underlining the quality of the field, Worknesh Degefa – the winner in Dubai in 2017 - broke the Ethiopian record by 15 seconds to become the fourth fastest runner ever in 2:17:41. Her compatriot Worknesh Edesa took third in 2:21:05. Molla smashing the course record on his marathon debut and Chepngetich’s duel with Degefa were the undoubted highlights. The Kenyan was having problems identifying her drinks’ bottles at feed stations, and regularly fell behind, which may have cost her the Kenyan/African record held by colleague Mary Keitany, the second fastest in history with 2.17.01. As usual, more than 20,000 runners also took part in the associated 10km Road Race and 4km Fun Run as the Middle East’s biggest mass participation sporting event celebrated is 20th birthday in style. 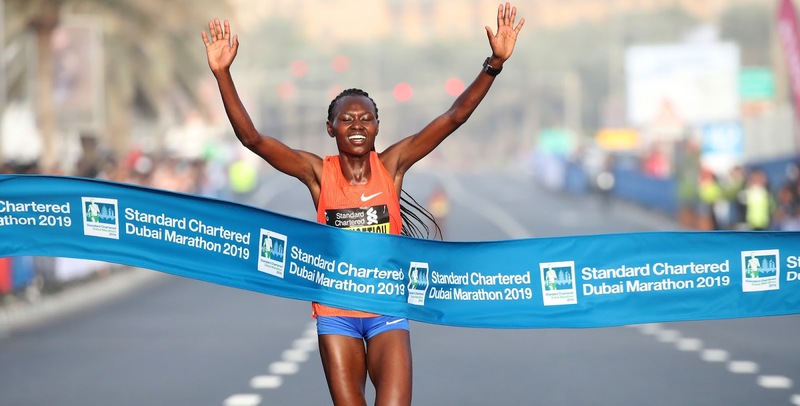 The event was streamed live with no rights restrictions and is available to watch on repeat at bit.ly/2019DubaiMarathon_Live.